Pulling together a funeral program for a beloved pet can be an emotional task. It gets even more overwhelming when you are already dealing with a loss. 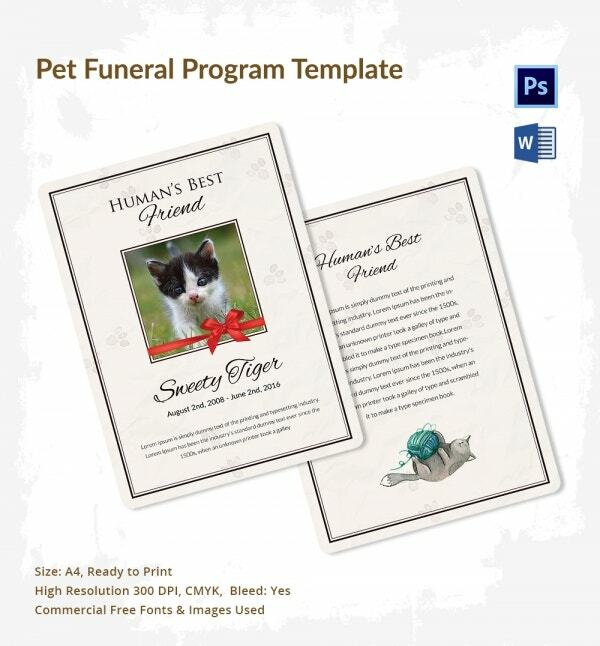 The Pet Funeral Program Template is a ready-made funeral invite that gives you a chance to mourn the loss of your beloved pet. 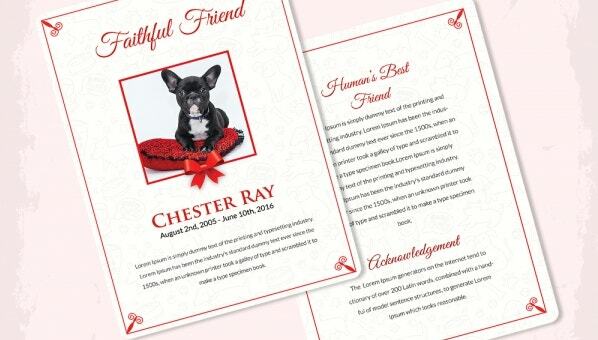 Anyone who wants to honor the memory of their pet can make use of these Pet Funeral Program Templates. All these templates are created with attention to detail that will help you remember the good old days with your pet. You can also see Funeral Booklet Templates. 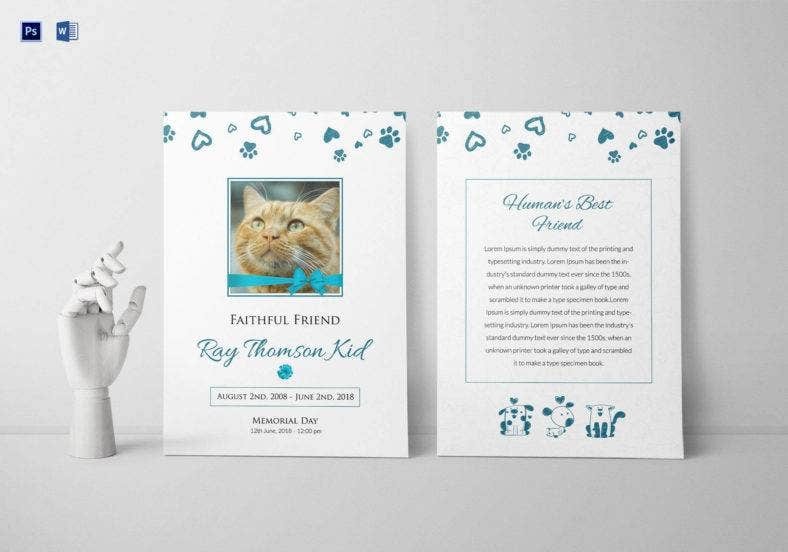 This is a simple yet beautifully designed per funeral program template which mentions everything that goes into a pet funeral program. This print-ready template is available in regular A4 size and offers a high resolution of 300 dpi. It comes with CMYK color mode and allows you to use commercial fonts and images as per your design need. 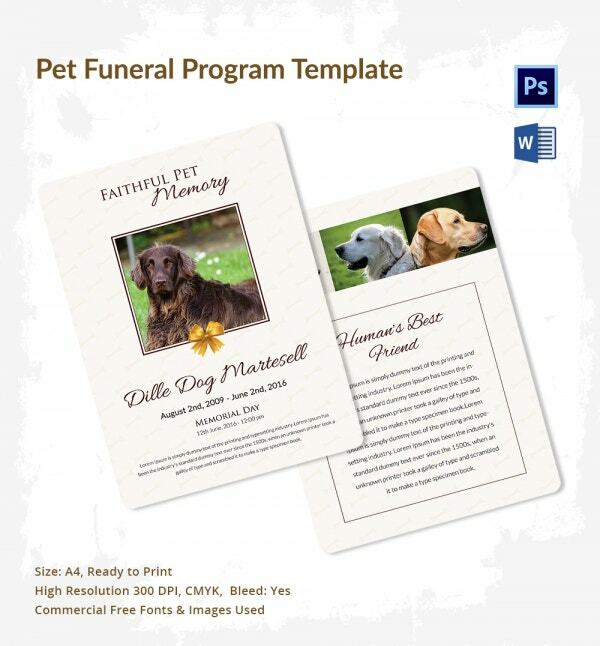 This Pet Funeral Program Template is a stylishly designed template and there is enough space available for you to put a photo of your dear pet on the front. This template comes in regular A4 size and offers a high resolution of 300 dpi. The CMYK color mode enables the print ready option. It is editable with both Adobe Photoshop and MS Word. So you can customize it using commercial fonts and images as per your requirement. This funeral program template is specifically designed keeping the emotional occasion in mind, and it conveys the message through its designs. It comes in regular A4 size with CMYK color mode. It is compatible with Adobe Photoshop as well as MS Word. This print ready template also offers a high resolution of 300 dpi. You can use commercial fonts and images to add further spark to your designs. This is a simple but stylishly designed template, and it comes in regular A4 size. High resolution of 300 dpi will give more clarity to your designs. 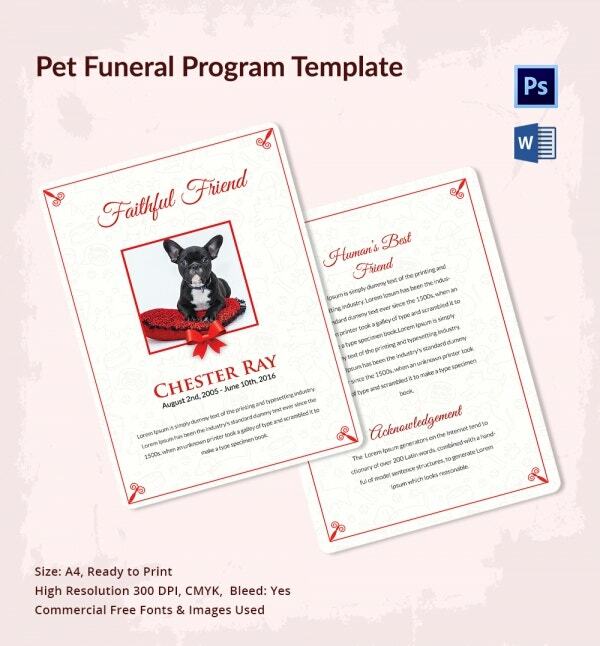 This Pet Funeral Program Template is print-ready and comes with CMYK color mode. It can be edited through either Adobe Photoshop or MS Word, and you can customize it further by using commercial fonts and images. 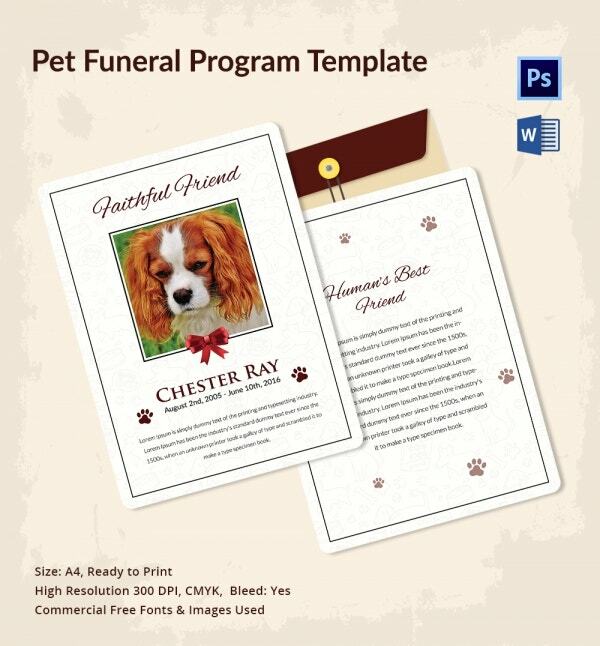 This Pet Funeral Program Template is a beautifully designed template that is fitting for the occasion. It comes in regular A4 size with a high resolution of 300 dpi. It is compatible with Adobe Photoshop and MS Word. It comes in CMYK color mode and offers a bleed of 5mm. This print-ready template allows you to use commercial images and fonts. You love your pet like a member of the family, in life and death as well. When that sad day finally arrives when your pet passes away, you obviously would like to pay the respectful tribute that your pet deserves. Remembering your pet with a funeral provides the opportunity to remember the good old happy times, honor your loved one, and say a final goodbye. The pet funeral is an honorable way to cherish the memories of the pet which can involve everyone who was a part of the deceased pet’s life. It is the most respectful way to mourn and remember the loss. The pet’s funeral may be held at locations such as the privacy’s of one’s backyard, in a pet cemetery, or at a funeral home. Pet funerals often include the sharing of fond memories of the deceased pet. Funeral guests may take a turn in telling stories of the pet’s life. The pet’s favorite toy, blanket, etc. are often included along with the pet’s body. It’s often that pets, whether they are dogs or cats, rabbits or horses, are more than just pets. They become an integral part of the family. These pets hold special memories and were right beside you through some tough as well as beautiful times. When your beloved pets pass away, remembering them can be tough, and people often conduct funerals to show their love and remembrance for their deceased pets. Thankfully enough, there are plenty of services available which can save you from spending more than you actually intended to. The cost of pet cremation can be much lesser than you might think. A pet that weighs less than 50 lbs is priced between $60-110 and pets that weigh more than 50 lbs are priced between $145-$260 for cremation services. There is also the option of communal cremation service which is priced at less $50 per cremation. You need to be mindful of this pricing information while opting for your pet’s cremation and on the other hand, a high-quality memorial tribute to a worthy pet is priceless. When a pet passes away, it brings you another difficult decision and you may not be prepared to deal with it at that moment of loss. That is the decision of how to handle your pet’s remains. Many pet owners never even think about it until they come across such a day when they have to make such a decision themselves. Needless to say, this is not the best time to think calmly and rationally about the available options and reach a well thought out decision. But you shouldn’t opt for a decision which you may regret later on. When you face the death of a pet, your objective will be to preserve the memory of that pet, and your decision should be based on how you think that memory can be best preserved. Many people feel that providing a dignified burial or cremation for a pet is a final, fitting act of farewell. It is quite important for pet owners that they get to see their pet’s remains are treated with the same concern and care that they used to offer when the pet was alive. You can opt for various options like cremation, home burial, or cemetery burial for such occasions. The sad demise of pets can be very tough on its owners and their family members. For healing, it is necessary to deal with grief actively which only comes after the acceptance of the death of your beloved pet. These pet funeral templates allow you to plan a proper funeral for your pets through which you can show your love and respect towards them. These templates help you in arranging a fitting farewell for your pet, and that may help you in accepting the reality of life and death.